Chilaquiles are basically breakfast nachos. For serious. And I’m always surprised when people don’t know what I’m talking about when I talk about chilaquiles. I mean, they’re amazing. SO GOOD. Especially after you’ve made nachos the night before and have a lot of good things leftover. However, I just kind of fake chilaquiles at home. The basic thought is there: chips (or fried day old tortillas), eggs, other good stuff, salsa. That’s all you really need. But I like to call mine “cheaterquiles” because they’re never quite like the ones I get at the restaurant. This recipe is a total example of what I call “Iron Chef America: Home Edition” because I literally will just open the fridge to find things to throw in the pan and call it “Cheaterquiles”. It’s always nommerific. Get your veggies going in a pan. For the image above, I had chopped onions and zucchini. Add in some of that leftover nacho meat or whatever meat you might have if you’re using it. I’ve used leftover roasted chicken, grilled steak, pulled pork… whatever tastes good. 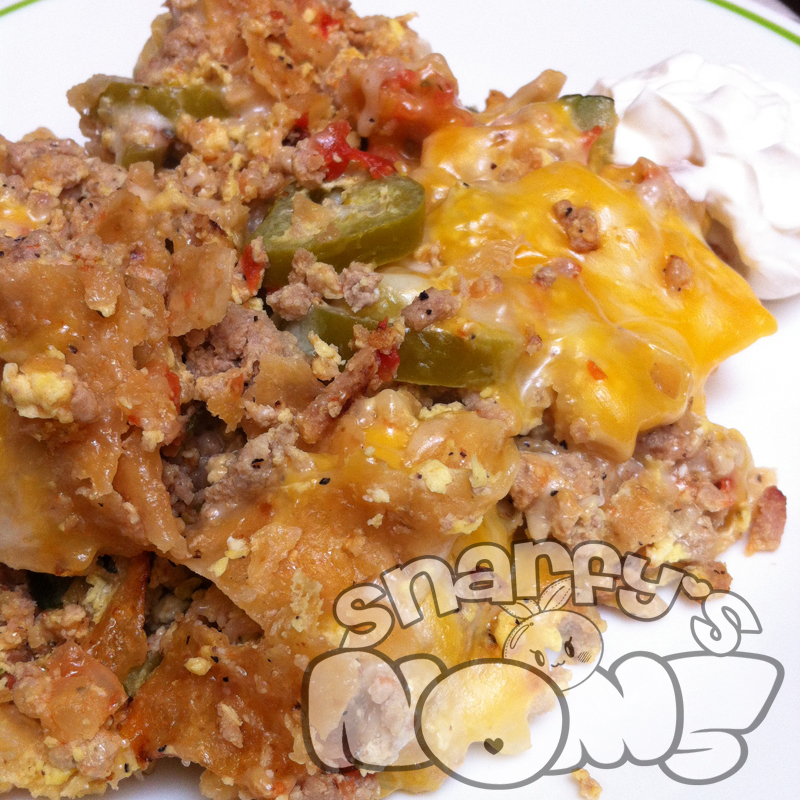 Scramble a couple eggs in a bowl, season with some pepper, and set aside.. Throw in a handful or two of tortilla chips. Once everything is heated, add those scrambled eggs and cook them. Once the eggs are cooked, add your cheese and salsa or enchilada-like sauce. There you have it – Cheaterquiles!